Origami papers. 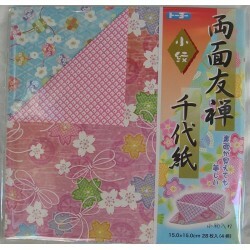 Washi papers, japanese kimono design or double-face. Origami There are 56 products. Origami 13,5 x 13,5cm, in washi rice paper.Handmade washi paper and printed by hands of an artisan in Kyoto. 10 fogli, different designs&colors. 15x15cm 20 sheets Yuzen Chiyogami, japanese kimono style's design20 sheets coloured paper (same color in both sides)washi (japanese rice paper) made in Japan It'll be arrived on August.